I have a soft spot for gnomes. I used to like to keep lawn gnomes in unexpected places around the house. It was an affectation I had. Like, you’d open the cabinet over the sink to get a cup, and hey look! A gnome! I’m over it now, but I still like gnomes. I also really like juice. 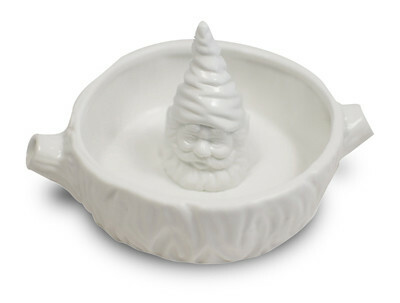 Et voila: now I can juice on a gnome’s head, and can legitimately keep a gnome in the cabinet! I love this! I rarely use one, so not on my list, but its so darned cute. I say take up that affectation yet again! The world needs more whimsy! Oh, and I hate rice pudding, but yesterday it looked really yummy. I might take a bite. Just one, but that’s better than the mental gag and hack I normally get. I have a thing for gnomes too! They remind of mischievous little old men – another thing I like (but not in THAT way). You find the cutest damn pottery its like you’re the pottery whisperer. But, this I can afford and shall own! anne, if i started doing it again, it would be too forced. and forced whimsy is no whimsy at all. emily, i like my gnomes inanimate. that’s one pointy gnome juicer!